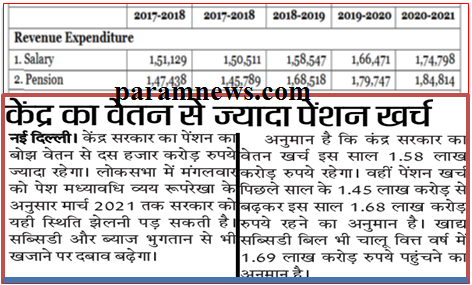 It is anticipated that salaries, and Grants-in-Aid salaries, will increase by about 5 percent over Budgeted Estimates of the year 2018-19. Same rate of growth is also expected in the year 2020-21. This assumes that an increment of 3 per cent and a Dearness Allowance increase of 2 percent will have to be provided to all employees under both Salaries and Grant-in-Aid Salaries. The projection in absolute terms is 1,66,470.90 crore and 1,74,797.72 crore for the years 2019-20 and 2020-21 respectively. For the purpose of calculation of Pensions, it is assumed that pension commitments will increase by around 7 percent over the budgeted estimates on 2018-19 in the year 2019-20 and 7 percent over that in the year 2020-21 The Pension commitments have been budgeted at 1,68,518.02 crore in 2018-19. In absolute terms, they are expected to increase to 1,79,746.50 crore in the year 2019 - 20 and to 1,84,814.36 crore in the year 2020-21.